How to achieve a whiter brighter confident smile – it’s never been easier! If you find yourself avoiding having your photograph taken or smiling with your mouth closed because you are self-conscious about the discolouration of your teeth, come and talk to us at The Dental Lounge @ Robina. We can help you achieve a bright confident smile in no time! There are a number factors that result in tooth discolouration. Coffee and wine, various foods and smoking are common causes. Exposure to tetracycline antibiotics in early childhood, certain medical conditions and natural aging can also affect the colour of your teeth. Today there are many different methods you can use to whiten your teeth. Here is a breakdown of some of the popular whitening treatments from home-based options through to professional whitening techniques. Whitening Toothpaste – You will find that most major toothpaste brands have a whitening option for removing teeth stains, however the whitening effects are mostly due to its abrasiveness and will take longer to see results compared to other options. Whitening Mouthwash – Mouthwash containing hydrogen peroxide can help prevent teeth from staining too much, however must be used immediately after consumption of foods and beverages that cause stains. Whitening Strips – These strips, which contain a film of bleaching agent, are applied to your teeth morning and night. At-home Whitening Kits – Your dentist may prescribe a whitening agent, usually a gel-like solution, which is applied to a mouth-guard like tray that you insert into your mouth and wear for around two weeks. The trays are transparent and can be worn from 2 – 8 hours discretely during the day, or as some people prefer overnight whilst sleeping. All whitening treatments depend on your lifestyle, but with proper care this method can give good results for 3 - 12 months. Teeth Whitening at your Dentist’s Surgery (e.g. 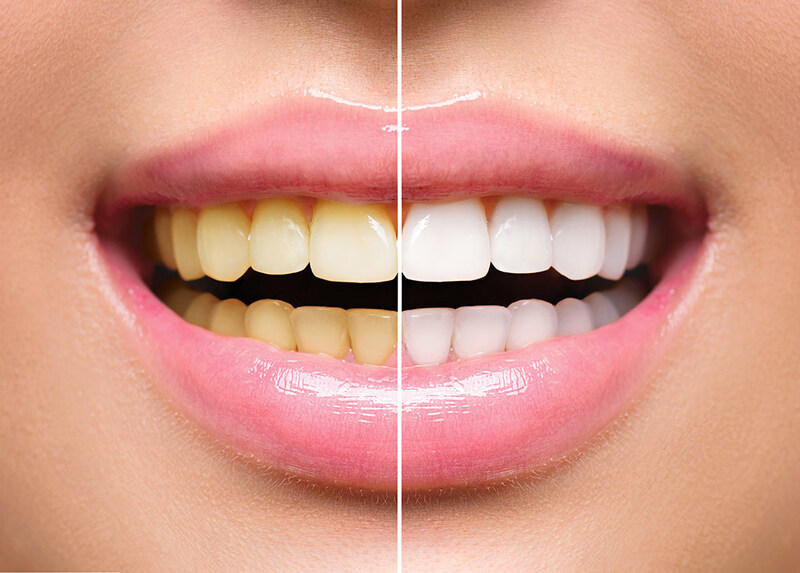 Zoom Whitening) – A gel is applied to your teeth and then an LED light is used to whiten your teeth up to 8 shades lighter over the course of an hour. This is a significant enhancement to the results achieved by home whitening alone. The Dental Lounge @ Robina offers two types of whitening services; Home Whitening and Zoom whitening. Advances in technology mean that these methods provide better results and whiter teeth with less effort. Contact us today, ph. 5580 8855 or send a message via our website. Our friendly team of dentists are ready to help you achieve a brighter whiter confident smile and it won’t take long!